A Course in Applied Linguistics for Arab EFL/ESL Students has been developed keeping in view the academic needs of native-Arabic speakers learning English as a second/foreign language. The book in the process of understanding how students acquire second language, sheds some light on how children acquire their first language. It reviews the observations of theorists on Contrastive Analysis, Error Analysis and Interlanguage as main factors that influence learners' performance. 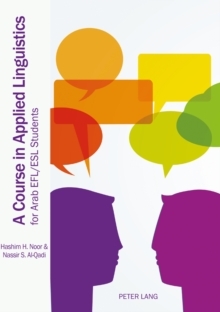 Some examples from real performance of Arab EFL/ESL learners are discussed and analyzed. The book reviews the observations of linguists and psychologists on the role of extrinsic and intrinsic non-linguistic factors that affect SLA. The book also gives good consideration of the views of experts on the efficacy of strategy training. At the end of each chapter, there are study questions to provide an opportunity for the readers to test their proficiency. Similarly, projects are also added for the students to practice. A list of references is added at the end of each chapter for further reading. The book has a rich Glossary to provide students with definitions of the most important terms.